Ballybrazil graveyard is about one kilometre from Scoil Mhuire. It's a very ancient religious site and is believed to be the oldest graveyard in County Wexford. Nowadays Ballybrazil is a townland but was once a parish in the Barony of Shelburne. In the 1830's it had over 384 inhabitants. It consisted of the townlands Ballybrazil, Aclare, Ballykerogue More, Ballysop, Coolerin North and South,Curraghduff and Milltown. Before Cromwell invaded in 1649 this land was owned by the Suttons and consisted of 2,370 acres. It was later owned by Rev.William Gifford who was the local landlord. He lived in Ballysop House and died in 1866. The graveyard is rectangular and is surrounded by a stone wall. It is very like a ráth or ancient fort. It measures 94 metres by 86 metres. This enclosure also contained a church but only the grass covered foundations can be made out. In 1837 when Samuel Lewis published his study of Co. Wexford,Ballybrazil church was in ruins. A holy well, dedicated to St.Crone, was nearby. The site could also have had a fosse or moat around it. The graveyard can be entered either by gate or stepping stones. In the 1850's Henry Cross rented over 37 acres from Rev.Gifford at £21 per year.He lived in Ballysop. Another headstone which is of interest was erected by Michael Doherty of Ballykelly. 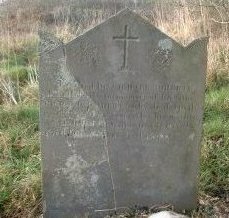 The inscription reads: 'Erected by Michael Doherty, Ballykelly, in memory of his father Richard Doherty who died in 1861 and his mother Anne, alias Glascott,who died in 1867 aged 78 years.' Richard Doherty,who lived in the townland of Ballybrazil, rented over 25 acres at a rate of £18 per year. The Irish for Ballybrazil is Baile Uí Bhreasáil. The name of the original Irish owner of Ballybrazil was Ó Breasáil. The translation is 'the townland of the son of Brazil' and we can see that Ó Breasáil must have been an important and wealthy man to give his name to both the townland and parish. When the Normans came they kept these same names of the townlands and parishes and turned them into manors. In the 1800's a small woollen mill was to be found in Ballybrazil and provided welcome employment. In 1798 the headquarters of the rebel army was in Ballysop House which is closeby. Please remember that this ancient graveyard is still in use. Seán Crowley.